As is the case for all members of National Evangelization Teams, the mission of “Netters” at St. Elizabeth Ann Seton Church in Hastings is to bring teens closer to Christ and embrace the life of the Catholic Church. For Dylan Heiman, a senior at Hastings High School, that mission has changed his life. After participating in the RCIA program at St. Elizabeth Ann Seton this year, Heiman will be baptized April 23 at the Easter Vigil, surrounded by the NET team leaders and other new friends from the parish youth group who have made a profound impression on his life and his faith, which he said “really wasn’t there” in the past. This is the second year that a NET team has been in place at St. Eli­zabeth Ann Seton (with the exception of one of the leaders, Dan Driver, all were new to the parish group this year), and it is the first year that All Saints in Lakeville has had a NET team. Both have been working a the parishes since September and will end their service in May. NET team member Renée Trzna­del (pronounced Sch-nadel) said small groups at All Saints have been particularly successful this year, in­clu­ding one called “Beloved” that she and fellow Netter Charlotte Michels led for girls in ninth through 12th grades. “We talked to the girls about looking at Mary as a true example of femininity and what it means to be God’s beloved,” said Trznadel, add­ing that another focus of this group was on the role the media plays in society regarding relationships and self-esteem. There are co-ed groups as well as a group for young men at All Saints called “The Man Cave” led by Netter Dalton Gonzalez, where the teen boys “can just hang out and spend time in fellowship,” said Trznadel, who adds that parishioners have often donated snacks for this and other NET gatherings. 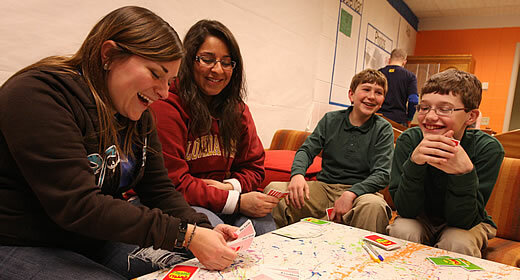 NET teams at both parishes also host a Friday afternoon club where kids can come in after school and relax or play games with leaders and with one another. There are discipleship training groups available throughout the week as well as one-on-one meeting and faith sharing opportunities. Another popular activity is the Open Team Prayer, to which the youth and all members of each parish are invited on Saturday morn­ings. Amber Rose (A.R.) Yakkel is one of the 11 team members, all between the ages of 18 to 28, at St. Elizabeth Ann Seton. She thinks the proximity of their ages to those of the middle- and high-schoolers they work with as part of their ministry is a definite plus. Nina Buss, a senior at Farmington High School, has been actively involved with the NET program at All Saints this year. She views the Netters as “role models” and has appreciated how they have helped her cultivate leadership and faith-sharing skills. While he admits that he wasn’t very involved in his faith prior to the arrival of NET at the parish, he said his experiences with the leaders and with other kids in the parish youth group — many of whom also attend Lakeville North and have become his close friends — have given him a new perspective on the church and his relationship with Jesus.